Sea Shore Building and Pest Inspections is a locally owned & operated Sunshine Coast building and pest inspections business. We believe in providing thorough and professional Sunshine Coast building and pest inspections to all of our customers, and we’re looking forward to doing your next pre-purchase building and pest inspection on the Sunshine Coast. We service all local areas of the Sunshine Coast Queensland including but not limited to Marcoola, Noosa, Mooloolaba, Maroochydore, Nambour, Caloundra, Buderim, Coolum, Landsborough and the Sunshine Coast Hinterlands. The purpose of a building and pest inspection is to warn you about any significant damage to the building and needs to be carried out by a professional. A licensed building inspector will have the experience needed to find the most common building faults and give advice on the significance of the fault. Shane has worked in the building industry for the last 40 years, with thorough experience in all aspects of the building industry. Sea Shore is fully licensed by the QBCC to provide Sunshine Coast building and pest inspections. You or a representative are free to accompany Sea Shore during your comprehensive Sunshine Coast building and pest inspection. 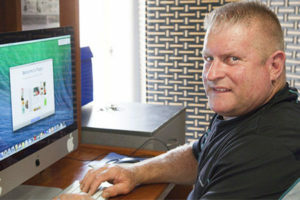 Having worked in the building industry for 40 years Shane has a great construction knowledge base. 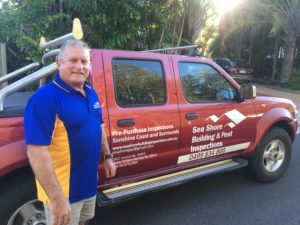 Being local Sunshine Coast building and pest inspectors, the Sea Shore team can set your mind at easy with our comprehensive Building & Pest Inspections.